Internationally renowned artist/author, Michael V. Smith, will be conducting a FREE writing workshop on Monday June 11th, 7-9 pm, at Definitely Superior Art Gallery. The workshop entitled, My Hand is a Red Brick, is a very fun and easy workshop for all levels of writing, exploring how images work and wander around in imaginative space. The workshop will be looking at the relationship between structure and imagery, this workshop sources film, poetry, and fiction to help you build (better) writing machines. What is the relationship between a story’s objects and its structure? How do the images you choose (re-)make meaning? What strategies of thingness and order can you use to better guide a reader towards your creative question? The workshop uses group mind-mapping, story-making, cultural analysis and writing exercises. 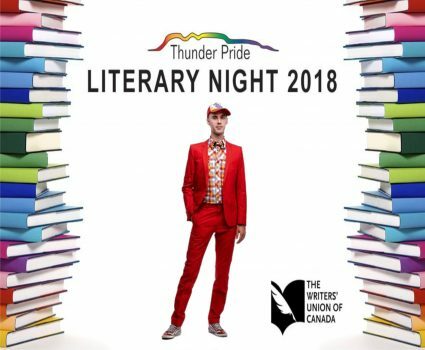 Michael will also be headlining Thunder Pride festival’s FREE Literary Evening on June 12th (7-9pm) at Mariner’s Hall. For more INFO, please visit. Michael V Smith, is the author of the books BAD IDEAS, Cumberland, What You Can’t Have, Progress, My Body Is Yours, and Body of Text. His videos have played around the world, in cities such as Milan, Dublin, Turin, London, New York, Toronto, Paris, Geneva, Berlin, Glasgow, Lisbon, Beirut, Amsterdam, Copenhagen, Buenos Aires, SF, LA and Bombay.